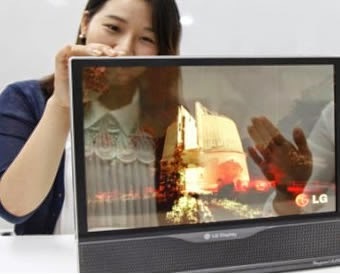 LG introduced its new OLED flexible screen. This prototype 18-inch has a resolution of 1,200 x 1,800 pixels and is capable of bending up to 3 inches in radius. Furthermore, to increase elasticity and reduce the panel thickness is in the back of a new polyamide layer (instead of the typical plastic). But not only has improved the process of flexibility, but it has also managed to merge with technology transparency. Covirtiendo this product in the first elastic and transparent screen world. According to In-Byung Kang, Senior Vice President and head of the department of research and development of LG Display, LG 2017 this prototype will have improved to the point of offering a flexible and transparent OLED panel Ultra HD 60 inches, which could well TVs mounted in about four years.